Martha Reed Mourfield, 93, of Oak Ridge, passed away Sunday, October 14, 2018 at NHC Health Care. She was born May 23, 1925 in Roane County, TN, the daughter of Will and Bessie Hatfield Reed. Mrs. Mourfield retired in 1984 from Union Carbide Nuclear Corporation after 38 years, where she was employed at the K-25 plant. 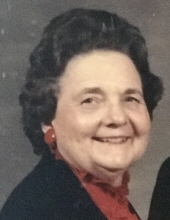 She was a long-time member of Central Baptist Church of Oak Ridge and enjoyed church activities, cooking, baking, and reading. She was an avid traveler and had visited 48 states and abroad. In addition to her parents, she was preceded in death by her beloved husband, Cecil E. Mourfield, December 20, 2009 and sister, Bonnie Reed Peacock. She is survived by sister, Myrtle Reed Reed of Rockwood and a host of nieces and nephews. The family will receive friends on Wednesday, October 17, 2018 from 10 – 11 am at Weatherford Mortuary. Family and friends will meet at 11:30 am at Oak Ridge Memorial Park for a graveside service with Rev. Glenn Ellis officiating. Memorial contributions can be made to the Central Baptist Church, 130 Providence Road, Oak Ridge, TN 37830. An on-line guest book can be signed at www.weatherfordmortuary.com. To send flowers or a remembrance gift to the family of Martha Reed Mourfield, please visit our Tribute Store. "Email Address" would like to share the life celebration of Martha Reed Mourfield. Click on the "link" to go to share a favorite memory or leave a condolence message for the family.